The dating-site company sold off with the market last month, and its stock has continued to sink in November. 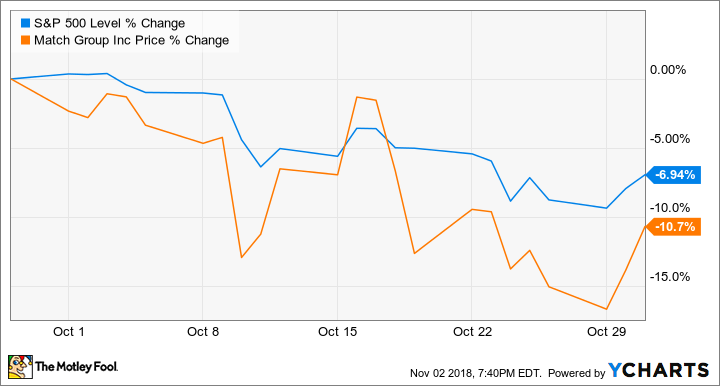 Shares of Match Group (NASDAQ:MTCH) dipped 10.7% in October, according to data provided by S&P Global Market Intelligence. The stock posted double-digit declines in conjunction with sell-offs for the broader market. There doesn't appear to have been any company-specific news behind Match's October declines. But the company delivered earnings guidance in November that has prompted even steeper sell-offs. Match published third-quarter earnings results after market close on Nov. 6. Sales for the period climbed roughly 29% year over year to reach $443.9 million, and adjusted earnings per share for the period more than doubled to reach $0.39. 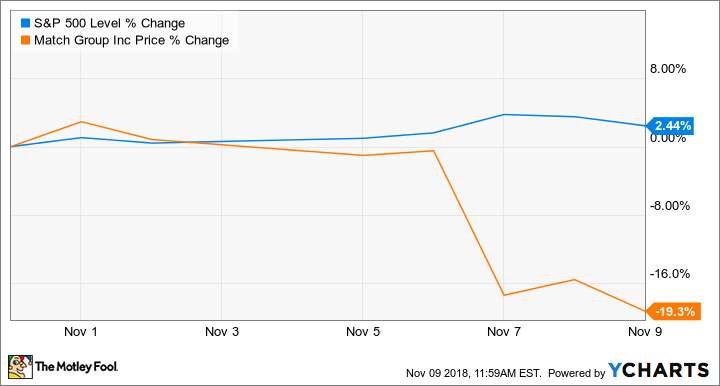 Top- and bottom-line performance for the period actually came in significantly ahead of the average analyst estimates, and the beat arrived with news of a special dividend of $2 to be paid on Dec. 19. But investors recoiled at the company's fourth-quarter targets. The broader market has seen some recovery in November, but Match has sat out the momentum shift. Shares trade down roughly 19.3% in the month so far, following its disappointing guidance for the current quarter. Shares fell roughly 17% in the day of trading that followed the earnings release and have lost more ground since. The company's fourth-quarter guidance for sales between $440 million and $450 million (representing 17% year-over-year growth at the midpoint) fell short of the average analyst-estimate call for sales of $454 million, signaling that revenue growth could decelerate. However, the company still expects to hit the top of its full-year sales target, and the fourth-quarter guidance factored in some currency-exchange headwinds. Even with recent sell-offs, shares are still up roughly 40% over the last year.